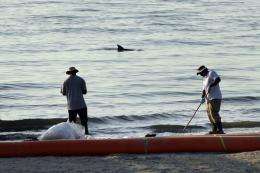 The dorsal fin of a dolphin is seen as clean-up workers collect tar balls of oil along a stretch of oil-contaminated beach in Grand Isle, Louisiana, in 2010. The deaths of over 150 dolphins in the Gulf of Mexico so far this year is due in part to the devastating 2010 BP oil spill and the chemical dispersants used to contain it, a report said Thursday. The deaths of over 150 dolphins in the Gulf of Mexico so far this year is due in part to the devastating 2010 BP oil spill and the chemical dispersants used to contain it, a report said Thursday. A total of 153 dolphins have been found in the Gulf so far in 2011, according to the National Oceanic and Atmospheric Administration (NOAA). Sixty-five of the mammals were babies. In a study on the effects of the spill, marine expert Graham Worthy of the University of Central Florida, along with 26 other experts, said the dolphins were found in a part of the Gulf that saw nearly five million barrels of crude leak in the worst oil spill in US history. "I suspect what we might be seeing are several things coming together to form a perfect storm," Worthy said. However, unusual cold waters that were partially to blame are also conditions that the dolphins could normally survive -- so the deaths "may also be seeing an indirect effect stemming from the BP oil spill," he said. "If oil and the dispersants have disrupted the food chain, this may have prevented the mother dolphins from getting adequate nutrition and building up the insulating blubber they needed to withstand the cold." BP last month pledged $1 billion to jump-start projects aimed at restoring the US Gulf Coast by rebuilding damaged coastal marshes, replenishing soiled beaches, and conserving ocean habitat to help injured wildlife recover. The funds are also being put towards restoring barrier islands and wetlands that provide natural protection from storms. By the time the well was capped 87 days later, 4.9 million barrels (206 million gallons) of oil had gushed out of the runaway well 5,000 feet (1,500 meters) below the surface of the Gulf of Mexico. Over a million gallons of dispersants were also deployed to break up the oil on the surface and deep underwater, and the environmentalists cautioned that their use was also a health hazard to animals and plant life in the Gulf, in some cases forcing large amounts of the oil to simply sink and clump together. Hundreds of miles of fragile coastal wetlands and beaches were contaminated, a third of the Gulf's rich US waters were closed to fishing, and the economic costs have reached into the tens of billions of dollars since the leak began in April last year after an explosion aboard a deep-sea drilling rig. Can Whales and Dolphins Adapt to Oily Gulf?